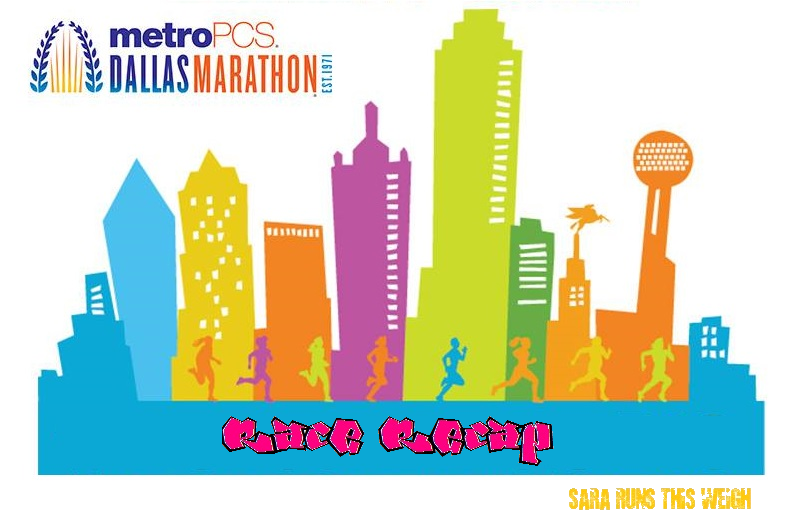 Okay, now I’m doing my Dallas Marathon recap! Like I said previously, I was super nervous leading up to the marathon. My last long run was that horrible 22 miler where everything kept cramping and seizing up on me. 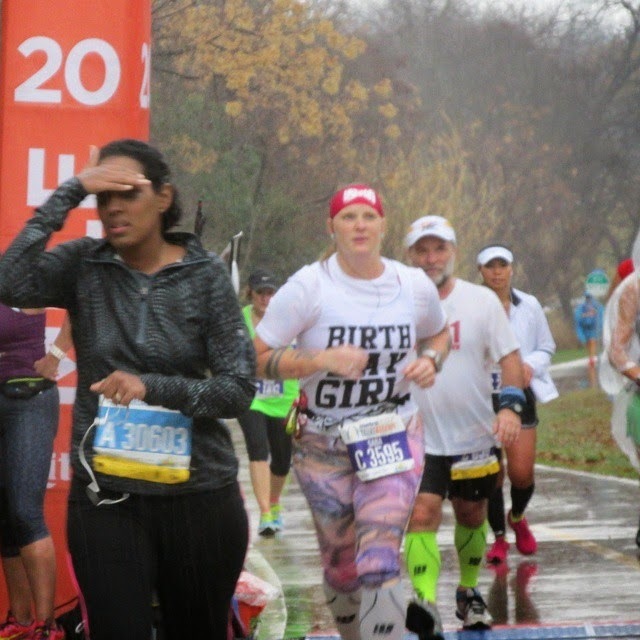 I was on the verge of being terrified that my marathon was going to go that direction as well. Thankfully, it wasn’t. 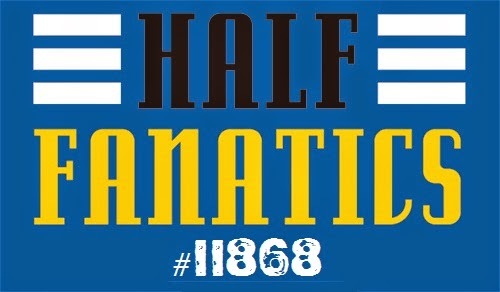 I think I figured out the problem with that run, too. I know I didn’t eat anywhere near enough carbs the day before and, really, I’m sure I could have hydrated better. I loved the course. It was fairly flat with only a few long, gradual hills to speak of that I really barely noticed. The aid stations were well spaced in my opinion and were well stocked with water and Gatorade. For the most part I stuck to the water. The Gatorade was just too strong for me, besides, I was taking in a gel regularly every 4-5 miles, so I didn’t really need the Gatorade on top of that. At some of the later water stops, like after the full split from the half, some of the aid stations had orange slices, so I grabbed some of those at a couple stations. The spectators. Oh my god, the spectators were amazing! The only part of the course I wasn’t a big fan of was the part that didn’t really have any spectators and that was the out-and-back by the lake. 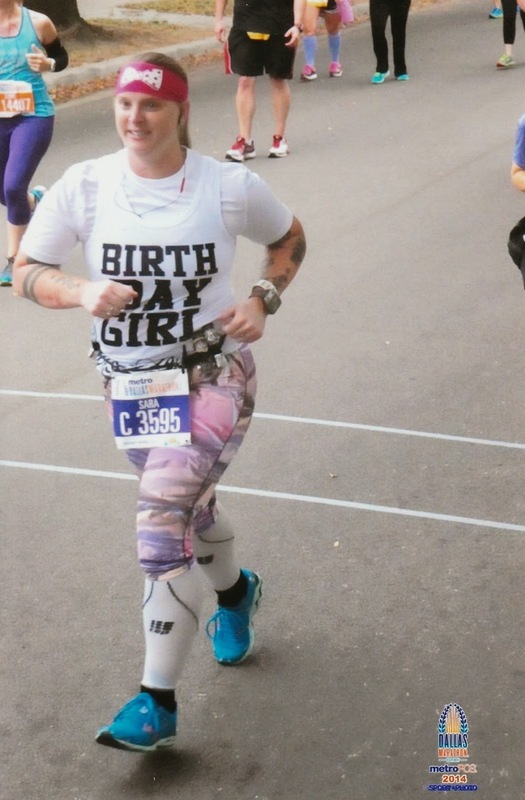 The best part of the spectators was their reaction to my shirt, the “BIRTHDAY GIRL” tank I was wearing. So many people yelled out “happy birthday!” and “hey, birthday girl!” One lady at one of the water stops actually started running with me and sang me happy birthday the whole way through! A few more people sang happy birthday as I ran by. When Carina joined me at mile 20 and ran with me for a couple miles, she would shout out “hey! I got a birthday girl here!” and the people would cheer super loud for me. At one point, there was some high school band kids huddled under one of those booth tent cover things and she ran up and asked the trumpet player to play happy birthday…and HE DID! I seriously felt like a celebrity. It was awesome and amazing. 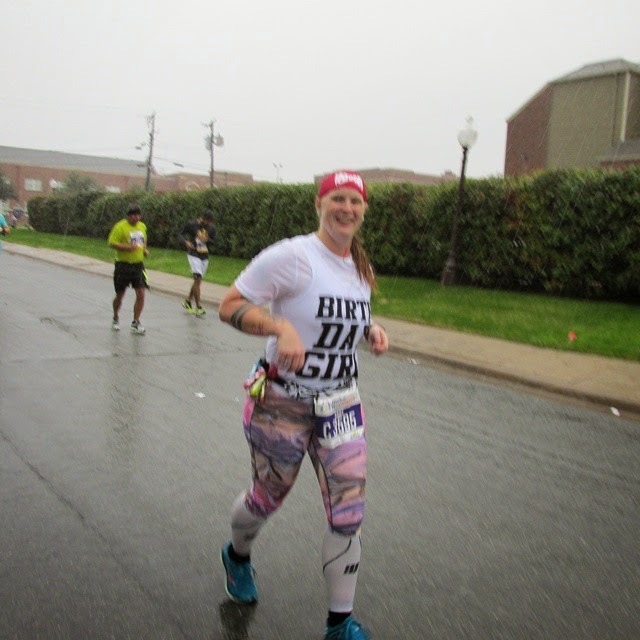 This was my most memorable race that I’ve done so far because of these reasons and, of course, because it was my first full marathon. Off and on while I was running, I kept getting emotional because I kept thinking about what I was doing, that I was going to accomplish something that less than 1% of the US population has done. This was huge and it kept hitting me. I figured I’d lose it when I crossed the finish line, but I didn’t. I did stop at the finish and do a little leap into the air with my arms raised, but, the photographers didn’t catch it. Ugh. That’s pretty much the only thing that I was truly disappointed with. But, basically all the photos that they did get of me were good pictures…YAY! 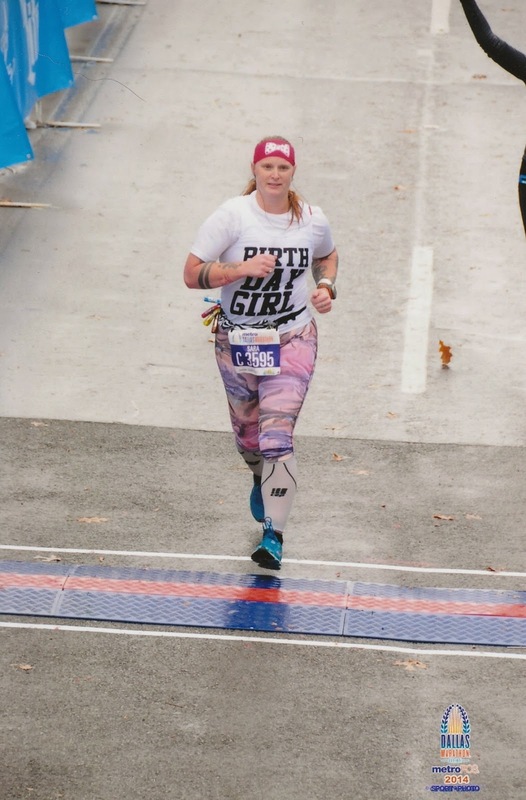 It was a little difficult to choose JUST 3 photos to buy, but I narrowed it down to my one of my finish line photos, the finisher’s photo they take with you and your medal and then one that was somewhere on the course, I don’t remember what mile it was. The photographer did get me my photos really fast, way faster than they said they would, so that was really nice. When Carina ran with me around mile 20, she asked me how I was feeling. I told her I felt great and that I couldn’t wait to run another marathon. True, I hadn’t yet finished this one and I still had about 6 miles to go, but I figured that if I was still doing great at mile 20, that 6 more miles really wasn’t going to change things much. Later at dinner, she told me I wasn’t normal for saying that. Usually, around mile 20 is where people start wondering why they thought running a marathon was a good idea in the first place but not me, nooooo, I couldn’t wait to do it again! 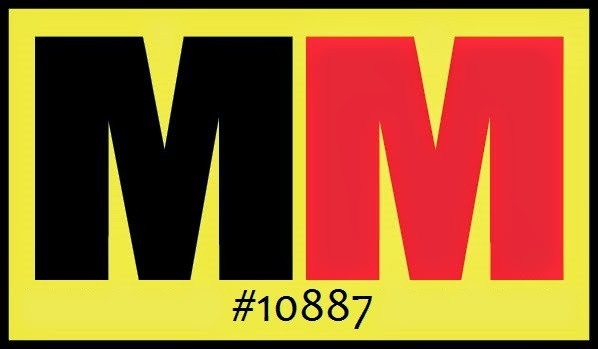 The good news, I don’t have to wait long as I won an entry to the Austin Marathon! 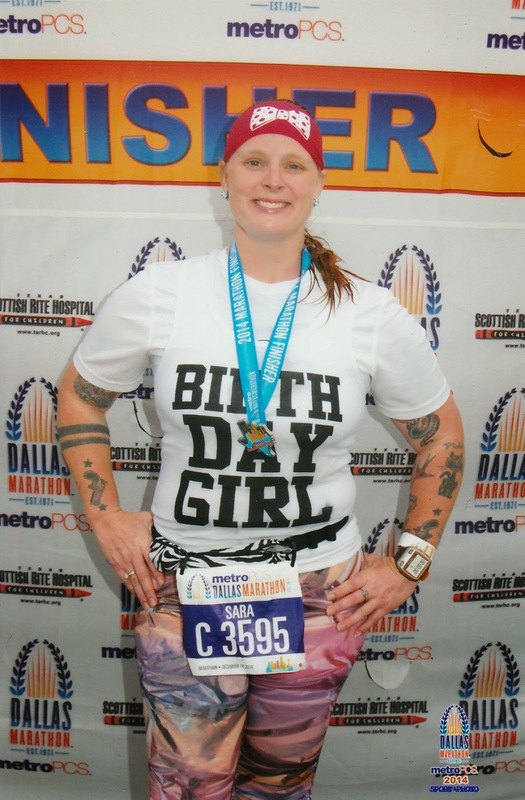 As soon as I crossed the finish line and had gotten my medal – my beautiful medal - my foil “blanket,” my finisher’s photo and other finish line goodies, I checked my messages. I had signed up for the text message updates for when I hit certain points along the course (5K, 10K, etc). The final one was, of course, when I crossed the finish line. It said 5:14:59 with an average pace of 12:01. However, my Garmin said 5:15:01, 26.77 miles and an average pace of 11:45. I’m inclined to go with the Garmin because I know I didn’t run the tangents and then there was the little detour about half a block off course to use that fancy port-o-potty after the full-half split. Also, even though it’s a USATF certified course, it’s not going to measure exactly the same as a GPS watch. So, really, the truth is probably in between what my watch said and 26.2. 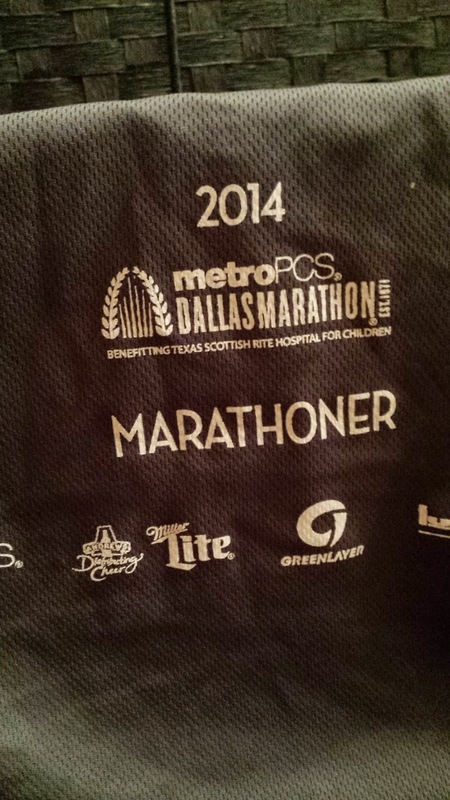 Something I really liked was when we were going through the finisher’s area, when they were giving you your little snack packs, they did it with one of those string backpacks and it has the logo for the marathon’s logo on it. I really like it too! It’s going to be my new race bag where I put all the things I need to take with me for races. Because I had also signed up for the marathon to post updates of my progress to my Facebook page, the people that didn’t sign up for the text updates could look on Facebook and see how I was doing. Because of this, by the time I got back to the hotel, stretched and showered, I had quite a few comments from friends and family. 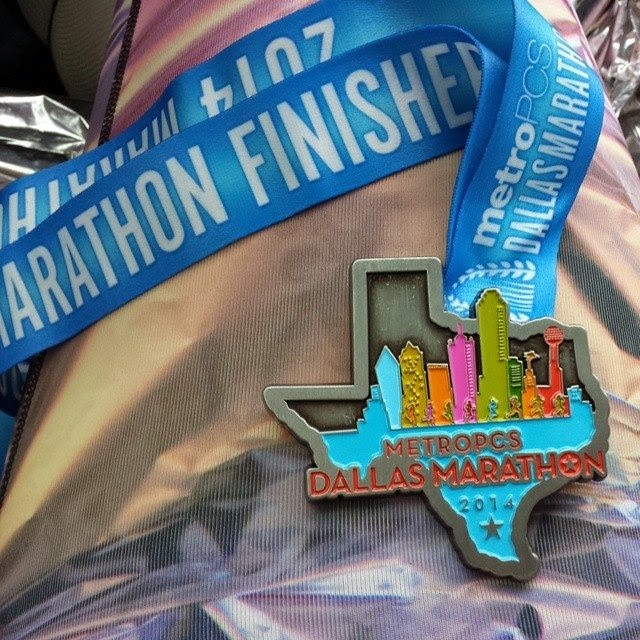 The one that really hit me was my mom telling me that I am now a marathoner! 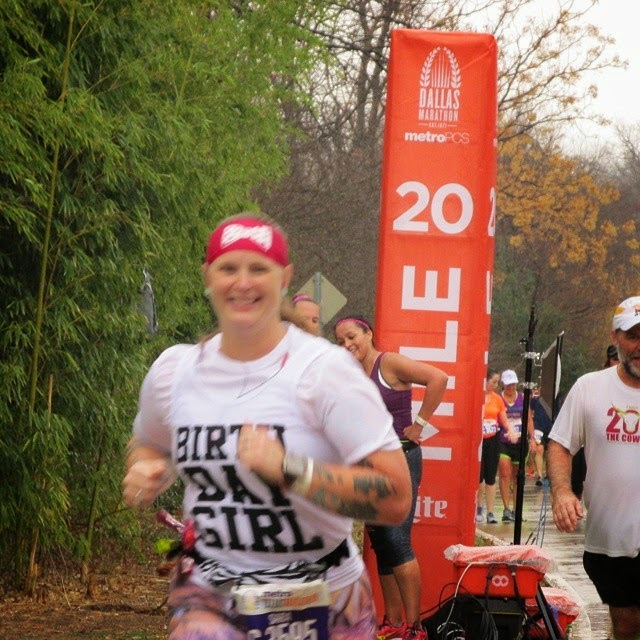 check out my time for mile 22!!! fastest mile of the entire race! just check out that smile! i was having a great time! crossing the finish line, still going strong! such a pretty medal! i love all the colors! it' official and i have a shirt to prove it!! !